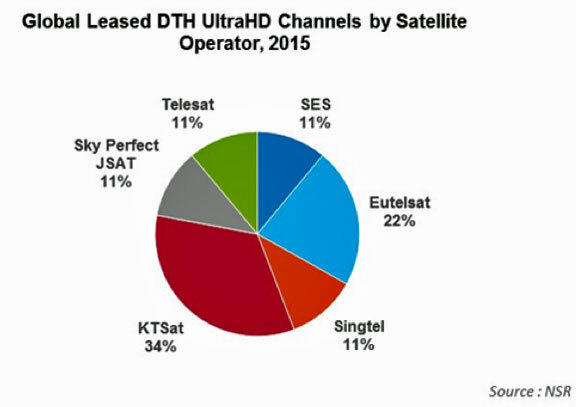 [Satnews] NSR’s UltraHD via Satellite, 3rd Edition analyses satellite-based UltraHD across three major methods of consumption —DTH, Cable TV and IPTV. With DTH platforms already having commercialized a small number of UltraHD channels, NSR explores the end-user requirements, ecosystem development, cost considerations and business model options for satellite operators and video platforms alike. UHD3 offers the most complete analysis of the challenges and opportunities facing the UltraHD market today, and the most comprehensive assessment of the future drivers of this emerging technology. UHD3 provides the reader with data across three different market platforms, 10 regions and all broadcasting frequency bands, allowing stakeholders in the UltraHD value chain to assess their market position moving forward in an increasingly competitive video market. This report enables service providers, satellite operators and video platforms to plan for the accelerating development and implementation of the new UltraHD format, by gaining competitive ground and providing the right mix of UltraHD channels tailored to individual markets. How soon, in what ways, and into what markets will UltraHD become mainstream? What additional revenues can be generated from UltraHD implementation, both directly and indirectly? What is the addressable market of top tier customers? At what rate will UltraHD TVs make their way into consumer households? What are the revenue prospects and capacity requirements for UltraHD broadcasts? Assessment of UltraHD business models – retention strategy or additional revenue base? The detailed assessment of the UltraHD market relies on input from key vendors as well as NSR’s longstanding, extensive body of work in the video markets and application segments. This provides a solid quantitative and qualitative basis from which a comprehensive analysis of trends and market forecasts can be drawn.